Cabalist, Talmudist, and grammarian; born at Cracow, Galicia, in the first quarter of the seventeenth century; died at Fürth, Bavaria, Feb. 2, 1684. He was the son of one of the wealthiest Jews of Cracow, who owned a stone mansion and two adjoining stores on Casimir place, a street otherwise uninhabited by Jews. 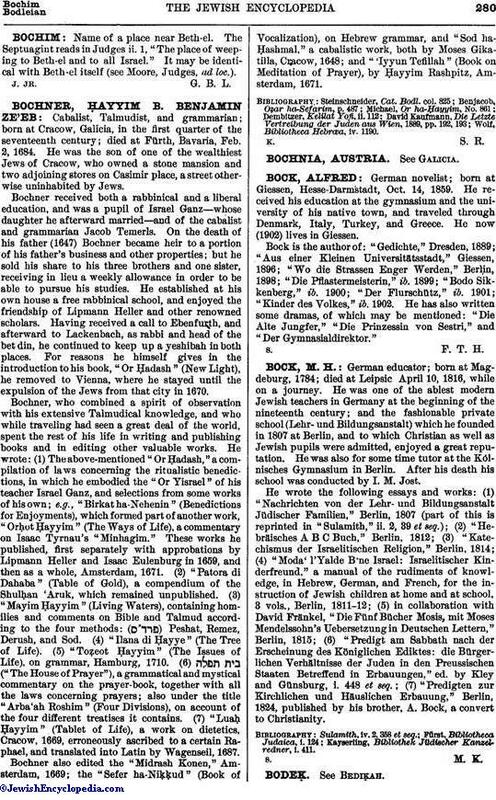 Bochner received both a rabbinical and a liberal education, and was a pupil of Israel Ganz—whose daughter he afterward married—and of the cabalist and grammarian Jacob Temerls. On the death of his father (1647) Bochner became heir to a portion of his father's business and other properties; but he sold his share to his three brothers and one sister, receiving in lieu a weekly allowance in order to be able to pursue his studies. He established at his own house a free rabbinical school, and enjoyed the friendship of Lipmann Heller and other renowned scholars. Having received a call to Ebenfurth, and afterward to Lackenbach, as rabbi and head of the bet din, he continued to keep up a yeshibah in both places. For reasons he himself gives in the introduction to his book, "Or Ḥadash" (New Light), he removed to Vienna, where he stayed until the expulsion of the Jews from that city in 1670. Bochner, who combined a spirit of observation with his extensive Talmudical knowledge, and who while traveling had seen a great deal of the world, spent the rest of his life in writing and publishing books and in editing other valuable works. He wrote: (1) The above-mentioned "Or Ḥadash," a compilation of laws concerning the ritualistic benedictions, in which he embodied the "Or Yisrael" of his teacher Israel Ganz, and selections from some works of his own; e.g., "Birkat ha-Nehenin" (Benedictions for Enjoyments), which formed part of another work, "Orḥot Ḥayyim" (The Ways of Life), a commentary on Isaac Tyrnau's "Minhagim." These works he published, first separately with approbations by Lipmann Heller and Isaac Eulenburg in 1659, and then as a whole, Amsterdam, 1671. (2) "Patora di Dahaba" (Table of Gold), a compendium of the Shulḥan 'Aruk, which remained unpublished. (3) "Mayim Ḥayyim" (Living Waters), containing homilies and comments on Bible and Talmud according to the four methods: ( ) Peshat, Remez, Derush, and Sod. (4) "Ilana di Ḥayye" (The Tree of Life). (5) "Toẓeot Ḥayyim" (The Issues of Life), on grammar, Hamburg, 1710. (6) ("The House of Prayer"), a grammatical and mystical commentary on the prayer-book, together with all the laws concerning prayers; also under the title "Arba'ah Roshim" (Four Divisions), on account of the four different treatises it contains. (7) "Luaḥ Ḥayyim" (Tablet of Life), a work on dietetics, Cracow, 1669, erroneously ascribed to a certain Raphael, and translated into Latin by Wagenseil, 1687. Bochner also edited the "Midrash Konen," Amsterdam, 1669; the "Sefer ha-Niḳḳud" (Book of Vocalization), on Hebrew grammar, and "Sod ha-Ḥashmal," a cabalistic work, both by Moses Gikatilla, Cracow, 1648; and "'Iyyun Tefillah" (Book on Meditation of Prayer), by Ḥayyim Rashpitz, Amsterdam, 1671. Wolf, Bibliotheca Hebrœa, iv. 1190.